Natural lime with magnesium, dustproof granules which are dissolving easely. Increases rapidly the pH, and makes soils less acid. Ameliorates the soilstructure and guarantees strong and healthy plants/crops. Acitvitates the soil life. Granules which are spread very easely. Granulated lime is ideal for lawns due to the presence of magnesium. Application in ornamental garden, kitchen garden, greenhouse and fruit garden. Can be incorporated in the soil or spread afterwords. In general a rate of 12kg/100m2 per year is recommendable. Natural lime of fossile origin (Coccolites), rich in trace elements and soft acting towards the plants. 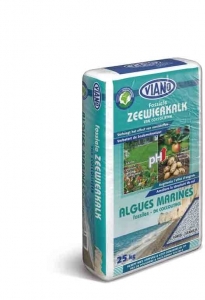 Viano seaweed lime from Coccolites derived from quarries is applied in acid conditions to increase the pH (and make soils less acid) or to increase the calcium (Ca) content in the soil. Calcium makes plants stronger. 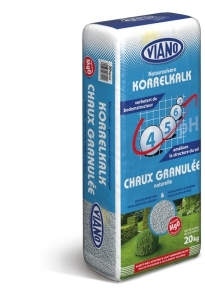 This type of chalk can be applied at the same time with the conventional fertilisers, without loss of nitrogen. Generally used in ornamental garden, kitchen garden, greenhouse and fruitgarden. 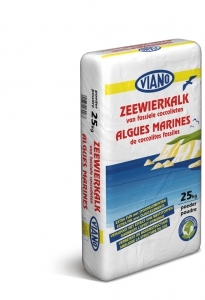 Viano seaweedlime from Coccolites is composed out of microscopically small organisms with a calcium structure. They were sedimented on the ocean sea bottom milion years ago. Viano Bio Lime contains useful bacteria for the decomposition of organic waste material (tatch). This product is the perfect addition to each NPK-­ menu of the plant. Iit ensures the presence of trace elements in the soil and ameliorates the balanced development of the grasses. Makes soils less acid and provides a better soil structure. 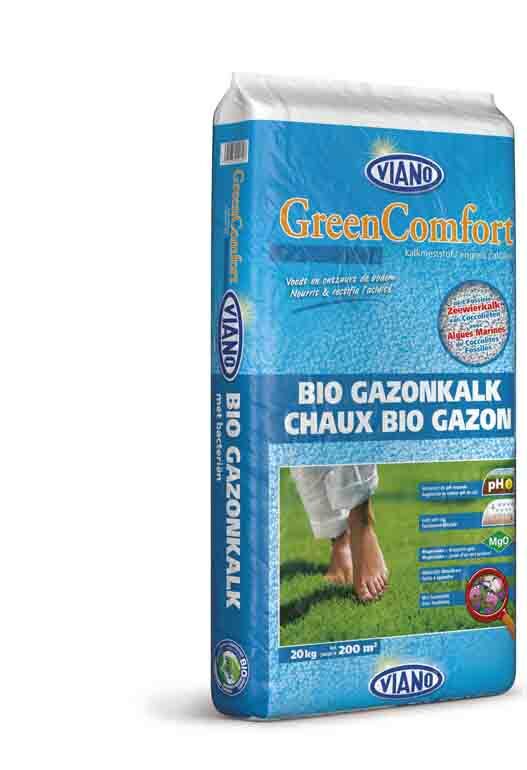 Viano Bio Lime can be applied on all type of lawns. Prevents the development of mosses in lawn . It contains extra magnesium for bright colours. To apply in early spring or autumn on all types of soils. Works 2 to 3 months.